In the article, Martin Roll discusses the opportunities available for Vietnamese companies to step up and build strong global brands in today’s fast-moving and competitive world. Much has been said about the reach of the Internet and more importantly, its power to disrupt current processes and practices. Nonetheless, it is clear that the Internet can also be a very powerful enabler for organizations. By allowing organizations the reach and tools to better serve their customer needs, the Internet has introduced an era of competition that allows both companies and customers to reap benefits in the long run. As such, organizations will be able to reap the most benefit if they choose to refine their business processes to not only respond to ongoing changes, but to anticipate and respond to customer needs in order to stay ahead of the curve. Technology and innovation are important success factors, but they are not the only reasons for companies to achieve success. They are a means to an end, not the end. Technology and innovation are disciplines that can be mastered and managed. Vietnamese companies should build their capabilities in these fields through collaboration with some of the leading experts in such fields. In order to advance an organization, it is important for its leaders to build and foster partnerships and strong ties across networks. Vietnam has huge opportunities for building brands and taking them regionally and globally. The question about brand building is less about financial capability, but more about the right mindset amongst owners and CEOs. Only then will the true potential of the organization be unleashed. Being family-owned is indeed a huge advantage for Vietnamese companies, as the business can take a more long-term approach to value creation and ensure that the brand is built by its founders’ vision and beliefs. It is important for Vietnamese family enterprises as well as state-owned enterprises to step up to this challenge and move up the value curve to prepare themselves for the future. Small and medium-sized enterprises (SMEs) can improve their brands in the domestic market and further build their brands outside of Vietnam, by aiming to the “most admired” in a class of their own. This does not necessarily mean being the largest company in the industry. Rather, it involves knowing an organization’s true purpose – what it believes itself to be best at, what values it stands for, and what it actually provides to its customers. If an organization is driven by a strong purpose and is able to meet or exceed expectations all the time, then it has a very good chance to become an “admired” company. Not surprisingly, this is not a position that comes easily. It takes a huge amount of attention to detail, focus and hard work over a long time to achieve a valued market position. Many companies from emerging economies, including those in Vietnam, have traditionally focused on asset-intensive industries. However, it has been demonstrated that the most profitable emerging market companies focus on intangibles such as human capital, exploiting network effects and creating synergies based on brands or reputation, rather than investing in tangible assets. Asian and Vietnamese boardrooms have traditionally been the playing fields for technology and finance professionals and most either have technology, operations or finance backgrounds. However, these capabilities alone will not be sufficient to sustain growth and enhance shareholder value in the coming years. With branding becoming more and more important, it is crucial that the boardroom represents branding capabilities and experience to ensure that brand guardianship is practiced at the highest and most strategic level in the organization. To achieve this, companies can consider educating and training their professionals to help them better understand the branding discipline, its opportunities and challenges. Companies can also consider elevating employees with strong market and branding capabilities to the board. In recent years, some Vietnamese brands have become successful beyond Asia. But with 1.36% of the global population residing in Vietnam, a fast-growing economy, and a rapidly growing middle class with increasing disposable income, Vietnam still boasts only a handful of powerful global brands. Despite its historical focus on manufacturing and trading activities, the global landscape could potentially see a growth in number of Vietnam brands in the years to come. In every industry sector, many companies in Vietnam are realizing the potential value creation they might be forgoing due to a lack of focus on branding. These companies are gradually making a mark in the region, having been inspired by industry leaders. To create iconic brands true to their roots and origin, Vietnamese leaders and managers will have to become trendsetters to a much larger extent than today. The future perspective is that in order to be successful, brands need to capture the spirit of the region but also lead the way by creating that spirit. 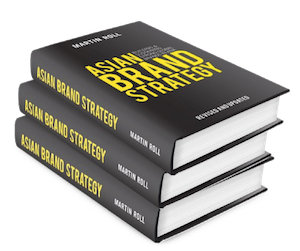 It is time for Asian and Vietnamese boardrooms to rid themselves of their inferiority complex and focus more on what Asia and Vietnam actually has to offer when it comes to brand building. This article appeared in the April 2017 edition of the Vietnam Economic Times in English and Vietnamese.